Answer: Ever since Pink Floyd’s classic album Dark Side of the Moon was released, that term has suffered some serious misinterpretation. 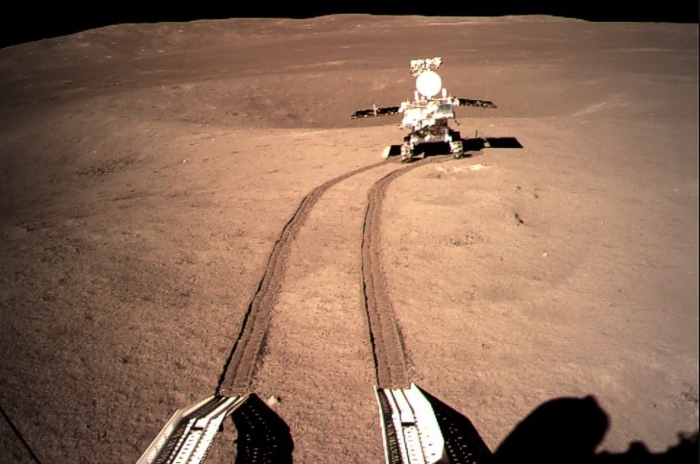 China did indeed drop their Chang’e-4 lander on the dark side of the Moon on January 3, 2019. The rover, Yutu-2, is named after the Chinese Moon goddess. The mission is notable for being the first soft landing on the dark side. The rover is still gathering data and returning images. The photo above is from the Chinese National Space Administration (CNSA). Thank you China. Nicely done. So here’s where the confusion comes in … the term “dark side” suggests this part of the Moon never gets any sunlight. References to this “dark side” date to the early 19th century. At that time, “dark” denoted “unknown” since this half of the Moon is never visible from Earth. The more accurate moniker is “far side” of the Moon. As you point out, the Sun is obviously shining in those photos. The one above shows the rover shortly after it departed the lander. And from the position of the rover’s shadow, the Sun would be elevated about 60° above the horizon. The Sun set about a week after this photo was taken, at which time the far side really did become the dark side. It has been known since antiquity that, except for the phase, the visible face of the Moon never changes. Only in the 17th century, after Sir Isaac Newton published his theory of gravity, did we understand why. Tidal locking keeps the same side of the Moon facing Earth all the time. (385,869 / 384,131)2 = 1.009 times greater than the far side. This differential force (known as a tidal force) distorts the solid body of the Moon by about 0.1 m, making it slightly “oblong” in the radial direction toward Earth. Actually, the tidal bulge isn’t perfectly pointed toward Earth — it rocks back and forth by a few degrees in a process called libration. But when the bulge gets too far off radial, the torque from Earth’s gravity pulls it back. It’s not unlike the motion of a pendulum. Pluto and its moon Charon are also tidally locked. See my July 20, 2016 post for more about that discovery. Watch the animation to see tidal locking in action. The view is from above Earth’s north pole. It shows one month of time. For simplicity (and so you don’t get dizzy), the Earth does not rotate 30 times. You can see how, over one orbit, all parts of the Moon receive equal amounts of sunlight. Because the Moon keeps the same side facing Earth, it is rotating with respect to the Sun. Mathematically, the Moon’s orbital period and rotational period are equal. Chang’e-4 sees about 15 days of daylight followed by 15 days of night. On the Moon, sunrise and sunset happen only once each month. Chang’e-4 is on the far side of the Moon for good reason. No other landers have explored that region, and from orbital photography the terrain appears dramatically different from the near side. There is still much to be learned about the far side, and it likely holds clues to how the Moon formed. The far side of the Moon would also be an excellent place for an observatory. During the 360 hours of night extended observations could be made, there’s no light pollution, and with no atmosphere the view is as clear as it gets. X-ray and gamma ray telescopes, which otherwise need to orbit above the atmosphere, could operate from ground level. And since the Moon is opaque to radio waves, radio telescopes would be totally free of interference from terrestrial broadcasts. There’s a lot of interest in the far side, and at some point there will be lunar colonies, but I expect those colonies will be near the poles for several good reasons. Further, if you did live in a colony on the far side, the Earth would never be visible. And that’s a view you wouldn’t want to miss.